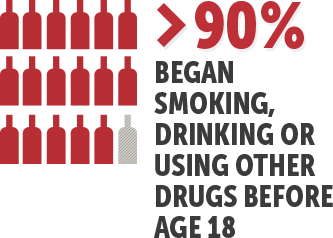 The Use Of Smoking, Alcohol and Narcotic Drugs Started Before Age 18! •Use of narcotic drugs other than heroin on behalf of 12th- graders surveyed dropped from 7 percent in 2013 to 6 percent in 2014. •In the past 12 months, use of OxyContin (a narcotic analgesic) declined in all three grades. Reports of use in the past 12 months stand at 1.0 percent in grade 8; 3.0 percent in grade 10; and 3.3 percent in grade 12. •Past-year use of Vicodin showed a significant five-year drop, with 4.8 percent of 12th- graders using the opioid pain reliever for non-medical reasons, half of what it was in 2009.